The Southern Double-collared Sunbird (Cinnyris chalybeus) was previously called the Lesser Double-collared Sunbird. There’s also a Greater Double-collared Sunbird (Cinnyris afer) which is evidently quite a bit bigger, with a broader scarlet collar and longer bill. To me the one pictured above looks like a Southern Double-collared, but the red band is broader than on others that I’ve photographed, yet doesn’t appear quite broad enough for a "Greater". To confuse matters further, there’s also a geographic variation of the Southern Double-collared called C.c. subalaris. It has a broader scarlet breast band, approximately two-thirds the width of the Greater, and a longer bill. So this could be a subalaris, as these birds are found in KZN, where I took the picture. 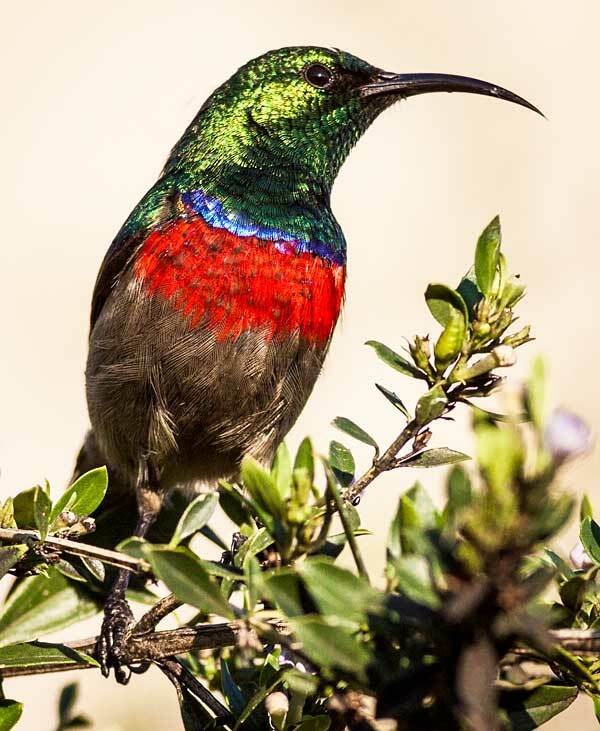 The info about C.c.subalaris is from a new book, Roberts Geographic Variation of Southern African Birds, by Hugh Chittenden and David Allan, with beautiful artwork by Ingrid Weiersbye.